The U.S. Navy plans to deploy two different hull designs to replace the service’s auxiliary ships that are about to be phased out, USNI News reported Wednesday. Last year, the Navy sought industry input on a common design to succeed its sealift ships, command-and-control ship, hospital ship, aviation logistics ship and submarine tender as part of the Common Hull Auxiliary Multi-Mission Platform program. During a Surface Navy Association event on Wednesday, Capt. 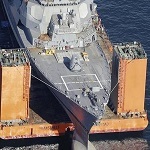 Scot Searles, strategic and theater sealift program manager at the Navy's program executive office for ships, said early feedback suggests the use of volume-centric and people-centric hull designs to address the program’s five mission areas. He added that the Navy will also commence service-life extension operations and procure used auxiliary ships if necessary. 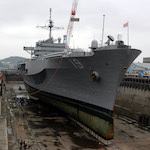 The Navy has repeatedly extended production lines for the General Dynamics-built Expeditionary Seabase and the Austal USA-built Expeditionary Fast Transport. Both firms said their vessels have enough space and flexibility to accommodate various missions, including medical activities.